WGT invited World Golf Tour player mrenn29 to contribute this blog post. As the 2011 Virtual U.S. Open Champion, mrenn29 won a trip to the U.S. Open at Olympic Country Club in San Francisco next year (see Virtual Open recap). Hello everyone. First off, I would like to introduce myself, for those whom I haven’t met, my name is Mike. I'm from Long Beach California. I love golf, have been playing for over 30 years and I am 37 years old. I try to get out when I can but we all know work will get in the way of golf. I joined WGT back in March of 2010. It’s kind of funny how I found WGT, I was bored at work one day playing some kind of card game done thru flash and an advertisement came up on the side of the screen for World Golf Tour, tee up now. So I clicked on it and here I am LOL. My first impressions of WGT were,WOW! Unreal graphics, famous courses and challenging. My second thought came after I double bogeyed the first hole on Kiawah, I said to myself, boy this game is tough! But I decided to stick with it and after the first month or so I started to see some progress. Then I took myself into the pro shop and decided to buy a wedge. Went back out and stuck a shot from 95 yards on St Andrews. From then on I was hooked! Then WGT decided to put the tier system in. What a challenge this was, but I am open to challenges. I kept practicing and playing with better players. And after over 1,000 ranked rounds later, I found myself hanging in there with some of the game’s best players. You can usually find me chatting with my fellow Deviation members on IRC (Internet Relay Chat). There you will find some of the best players in the world. I usually am playing with fellow members from the Deviations Country Club. Everyone in the club is a great player and a great person. My personal favorite course is Oakmont. Some may ask why, well I enjoy it because to this day it is still the most challenging course to me on WGT. It can still take a lot of strokes back from me if I am not careful. Now on to the Virtual U.S. Open. Being that we only had a little over a month or so to really get the feel of Congressional, I went into the open thinking, hey just give it your best shot and see what happens. Well the first round was a decent round of 62 for me. I was very happy with that even though it wasn’t the leader, but I was within 4 strokes after that round, so going into round 2 I knew I would have to go pretty low to have a chance especially with BolloxInBruges (Sam) (see Guest Blog post) up near the top, knowing he is fully capable of firing another round even lower. So I teeed it up, made birdie on first 3 holes, and then came the dreaded 4th. I had a wind that required a draw in order to find the fairway, but luckily I pulled it off and then just wanted to find the center of the green on the approach. After I sank the 38 foot bending putt was when the rhythm really started. From there the first 10 holes were all birdied. That’s when I said to myself, wow, I might actually pull this off. Then the nerves really set in, with pars on 11, 12 and 14, I started to sweat a little. But then I sank a nice 15 foot putt on 15 to get my hopes back up. So I finished with a 57 thinking, well I put myself in contention and that's more than I could ever ask for! I’m really excited to meet the folks at WGT at Olympic Club next year and maybe even play some golf while I am in San Francisco. I’m also planning on meeting some fellow members of the Deviations in San Francisco so it should make for a memorable trip. And finally, I would like to thank WGT and the USGA for giving us the opportunity to compete in major tournaments such as the U.S. Open, my hats off to all the WGT crew for introducing me to such an awesome golf game! This could be your best chance to play Pebble Beach! Cadillac has teamed up with National Kidney Foundation charity to launch the NKF Cadillac Golf Classic on World Golf Tour. It's 500 WGT Credits to enter and the proceeds go to the National Kidney Foundation charity, benefiting research and treatment of kidney disease. One player will be randomly selected to win the grand prize. Note, this is not a skill-based leaderboard tournament, all you need to do is enter and post your round for a chance to win. The tournament is a 9-hole closest-to-the-hole on Celtic Manor, site of the 2010 Ryder Cup. The grand prize is a dream golf trip to Pebble Beach for you and a friend, inculding airfare, three nights at the Spanish Bay Inn, and rounds of golf at Pebble Beach and Spanish Bay Links, valued over $3,500. See tournament rules for details and eligibility. This is a great way to support a worthy charity, plus a chance to win an epic golf trip! It's PGA Championship weekend, and golf's fourth major includes 100 top-ranked golfers from around the world. Who will join Charl Schwartzel, Rory McIlroy and Darren Clarke as major champions in 2011? Will Europe continue to dominate. You have to like Australia's chances with Adam Scott and Jason Day who were so close at the Masters. Or will an American finally break thru this year, like Bubba, Rickie Fowler, Dustin Johnson, Matt Kuchar or Nick Watney. And don't count out Phil or Tiger. One interesting storyline is Chubby Chandler, golf's new super agent, with three of his clients already winning 2011 majors, putting him in position for the "Chubby Slam" by having another client win at the PGA. His other clients include Lee Westwood, Louis Oosthuizen and Ernie Els, so Chubby has a chance. 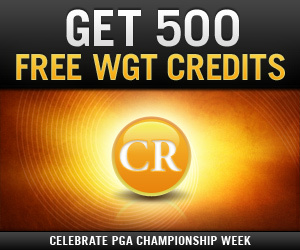 We're celebrating golf's fourth major at World Golf Tour this wekeend by giving away 500 extra WGT Credits when you buy $20 or more WGT credits, anytime during the PGA Championship, from Thursay 8/11 thru Sunday 8/14. Buy your WGT credits here. 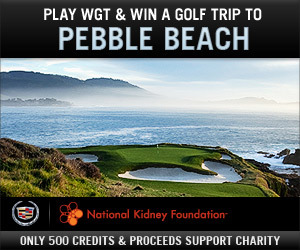 Enter the NKF Cadillac Golf Classic on WGT, with proceeds benefiting the National Kidney Foundation, and one random winner getting a dream golf trip to Pebble Beach. 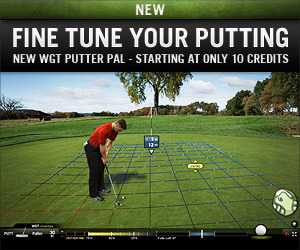 Check-out the new WGT Putter Pal to help fine-tune your virtual putting. Visit the WGT Pro Shop for all the latest virtual balls and clubs from Callaway, Cleveland, PING, SRIXON and TaylorMade. Note: One-time offer for WGT players buying 2,000 or more WGT credits 8/11/11-8/14/11. Improved based on player feedback! Challenge your WGT friends after any stroke play round. 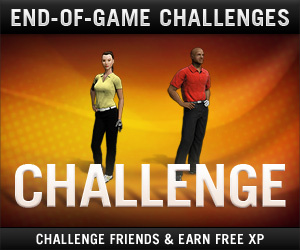 You each earn free XP and only the challenge results are posted to your feeds. Fine-tune your putting. The new WGT Putter Pal overlays on the swing meter when you're putting to help you make more precise putts. You can buy from 10 to 1,000 putts starting at only 10 credits. Makes a great gift too! Support the National Kidney Foundation charity and have a chance to win a golf trip to Pebble Beach. It's only 500 credits to enter the NKF Cadillac Golf Classic and one person wins, regardless of score. This could be your best chance to play Pebble! With WGT Country Clubs now on the Home page, it’s easy to find one of the thousands of WGT Country Clubs looking for members. Join for free and compete with others in private tournaments for credits. It's a great way to meet new players and enjoy the game! Royal St George’s, host of the 2011 Open, is now available on WGT for Ready-Go and Country Club tournaments. Below are the 299 WGT players who qualified for the Virtual Ketel One Cup Championship round. They finished in the Top 100 of the Virtual Ketel One Cup tournaments that were held on World Golf Tour from April thru July. The championship round is 18-hole stroke play on Congressional and scores must be posted by August 15, 2011. The best score wins a trip to TPC Sawgrass in Florida to compete in the real-world Ketel One Cup. See contest rules for details. NOTE, some WGT players were erroneously emailed about this tournament, but in order to be eligible to win the prize, you must have qualified in previous Virtual Ketel One Cup tournaments. See contest rules for details.